I was up visiting my family last week and my family and my sister asked me to help her get rid of some stuff from her garage. She has done a good job of cleaning it up and getting it all onto one side of the garage so she can park her car. Now she wanted to get rid of some of the bigger items and wanted some help. 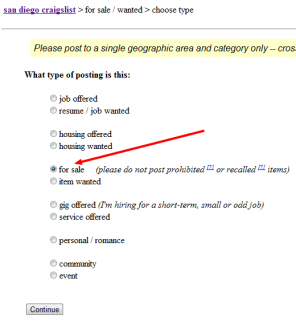 So for my 1AW I walked her through setting a post up on Craigslist. 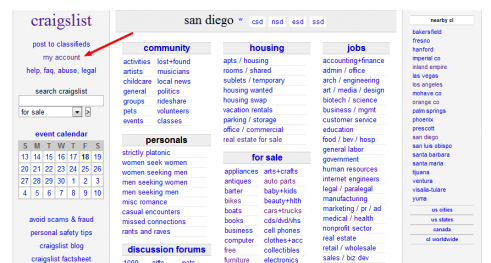 This is very easy so I thought I’d create a quick guide here to help any of you who may not be familiar with Craigslist. You can browse all the posts without an account, but you will need an account to post something. It is free. 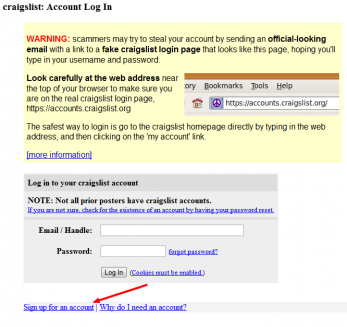 If you already have an account, simply log in with your email address and password. If you don’t have an account you can create one by clicking the “sign up for an account” link. Select the region you live in. put the city where you live in the specific location area. In the product description be as detailed as possible. 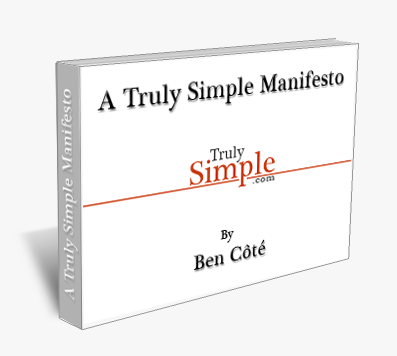 If I am selling something I will copy and paste the product description from the manufacturers website and include all relevant information. 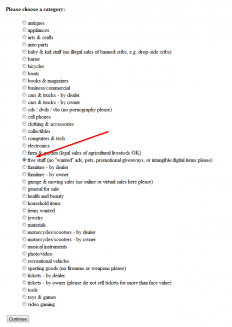 You want to weed out those that are truly interested in the item. If it has a big scratch on it you don’t want to waste your time having many interested parties come to see it only to walk away because of that scratch. Finally include how you’d like to be contacted. I only use email and never my phone. I made that mistake once and was inundated with phone calls while my wife was trying to take a nap. Emails are easier to go through and respond to. Here you can add 4 images. Add all that you can. 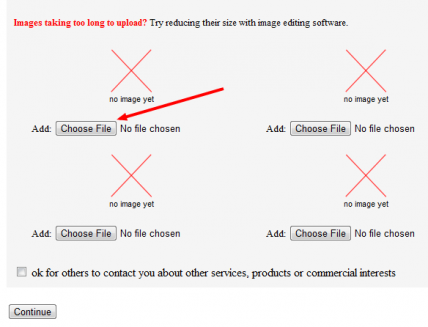 Click the “choose file” button next to each image area to select an image. Its important to take pictures of all sides of the item if you can. Click “continue” when you have added the images. the final step is to enter the words/letters/numbers in the captcha to prove you are a human and not some robot trying to spam the system. That’s it! 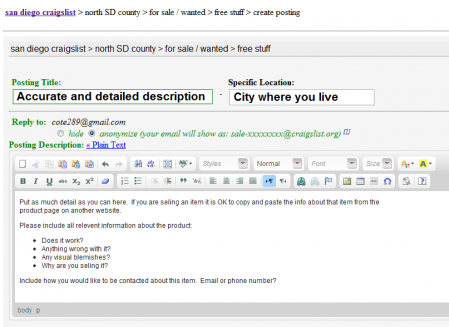 Your listing is now posted and you will start to receive offers via email for your items. If you are uncomfortable having people come over to your house to pick up the items you can meet at a local parking lot. That’s it. Its really very easy. 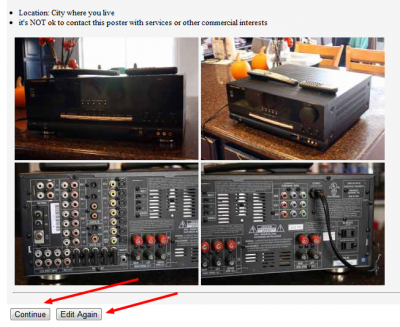 Got any other good Craigslist tips to share? Let me know in the comments. I cut the cord a long time ago. Much to the dismay of my beautiful wife, I was sick of paying so much for our TV cable bill, and was sick of watching so much TV, so I dropped it. We stopped getting TV, and shortly thereafter I canceled our home phone as well. 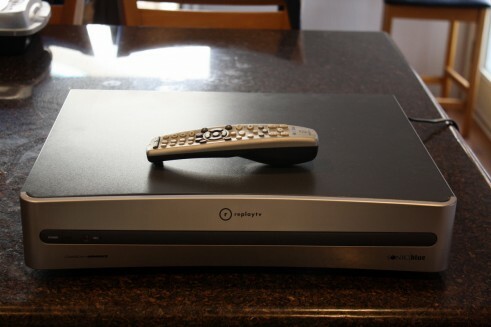 One thing I didn’t do at the time was get rid of our old ReplayTV DVR. Not sure why, but probably because I didn’t want to get behind and mess with all the wires to get it out etc. Well our old receiver was dying so I had to replace it, so I took the opportunity to clean out the electronics gear and get rid of the old ReplayTV. This thing was AWESOME back in the day. They had this sweet commercial advance function that juts automatically skipped all the commercials in your recorded shows. It was the best, and that is why they were sued out of existence by the wonderful Hollywood studios. But this DVR was still the best thing around. I even upgraded it with a bigger hard drive to record more shows. Sad to see it go, but Its been sitting around collecting dust and not getting any use, so on Craigslist it goes and hopefully someone can use it. We finally broke down and bought a new car. Well its not new, but its a second car for us. We had been sharing our car for several months since my old truck died. I didn’t mind sharing as I am working from home now and I didn’t need another car so we took our time, looked and shopped for cars. My wife, bless her heart, changed her mind many many times as some woman are able to do. When she finally found a car she liked, then we couldn’t find it in the color she wanted. So we waited some more. Then one day we decided just to get an old Jeep instead. And so we did. A red one. Its very nice. But it had a useless 1 1/4 inch tow hitch on it. 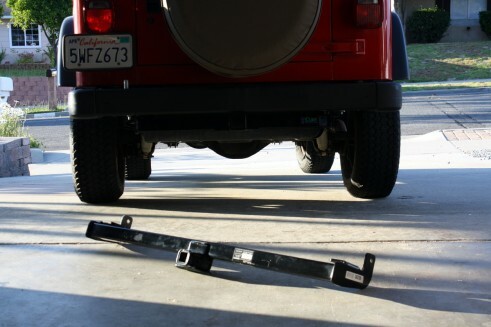 So I took that off today and put a real 2 inch hitch on it. And thus I am now selling the old one on craigslist for my 1AW this week. My 1AW project is in full swing and as I was out in the garage cleaning it up a little I found a whole treasure trove of crap I can get rid of. Here are a few things I found to get rid of this week. And a very old, but cool, Motorola flip phone. I found this random pile of stuff while cleaning off my workbench. I haven’t had home phone service in many years and forgot I had that phone still plugged in in the garage. I’m not sure why I have an extra set of mirrors and the flashlight is forever old and has just been floating around. So it all goes out of my house this week. 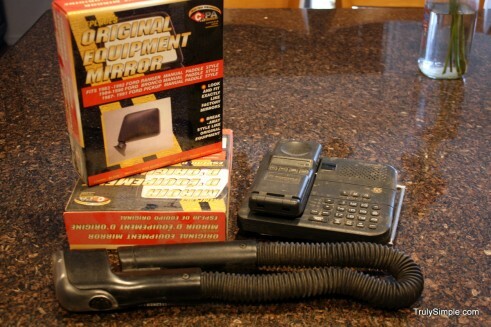 I may try to sell the mirrors as they are brand new, but the rest will probably just be donated. ok, 1 month down, 11 to go in the 1 A Week challenge. 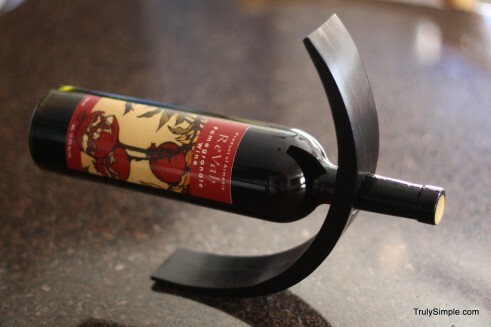 And to celebrate 1 month down I’m giving away a very cool wine holder we picked up in Malaysia. Rather than sell it on eBay or give it away on Craigslist, I want to give it away to someone who reads this blog. So all you have to do win this very awesome, handmade, wine holder (wine not included) is to simply put a comment below and tell everyone what you are getting rid of for your 1aw. that’s it, leave a comment and I’ll pick someone at random and will ship it to you for free.